A rough-and-tumble farce centered around a lively battle of the sexes, The Taming of the Shrew brims with action and bawdy humor. The unconventional romance between a lusty fortune-hunter and a bitter shrew unfolds to the accompaniment of witty, fast-paced dialogue and physical humor in this excellent introduction to Shakespearean comedy. The freebooter Petruchio arrives in Padua to hear of Katharina, a beautiful heiress whose waspish rants and caustic personality have repelled all attempts at courtship. Professing to admire a woman of spirit, Petruchio immediately sets about his wooing. The initial encounter between "Kate" and her wily suitor is spiked with impassioned exchanges of blows as well as jests. After a madcap wedding ceremony, the still-protesting Kate is whisked away to be "killed with kindness" and reborn as a loving wife. 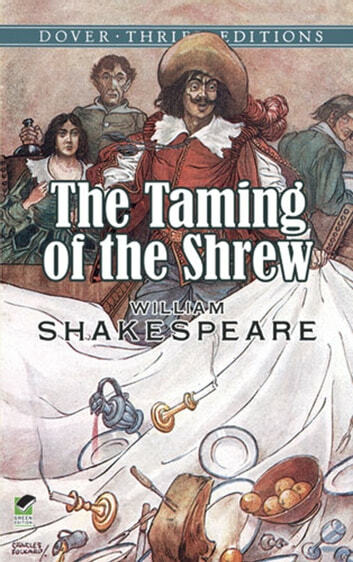 One of the Bard's earliest and most popular plays, The Taming of the Shrew is rife with subplots involving his customary devices of disguise and mistaken identity. The vivid language, studded with elaborate puns, is an engaging complement to the play's slapstick humor. 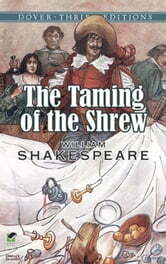 Reprinted complete and unabridged in this inexpensive edition, The Taming of the Shrew will delight any reader with its wonderful wordplay and rollicking good spirits.